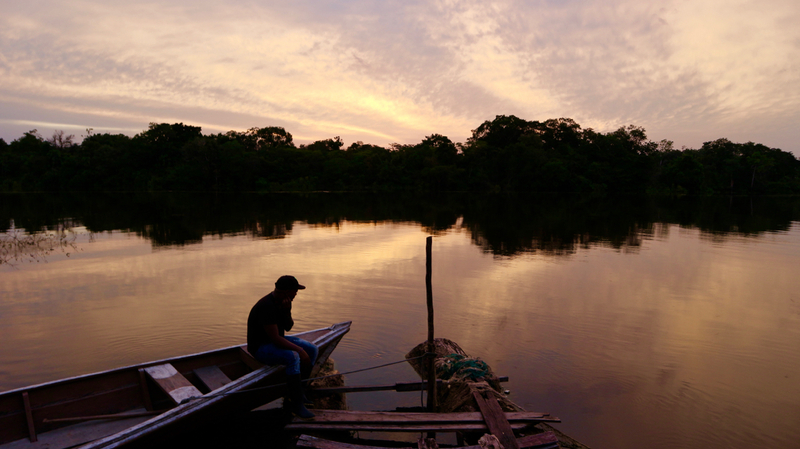 Fishing for Piranhas in the Amazon – Where is Lydia? Early the next morning, I met up with a group of other tourists in front of a tour agency. We were all given rubber boots and headed down to the Amazon River where we boarded a boat. We all put on life jackets and then began our journey. The Amazon River is actually quite dirty: the water is a muddy brown color and filled with quite a bit of trash, especially close to the cities. The boat roared full speed ahead until we reached the narrow jungle. A guide sat on the bow of the boat directing the driver where to go. I have no idea how they were able to navigate their way through the jungle. All the turns and narrow passage ways looked the same. When we finally exited the narrow jungle passageways, we arrived at a large clearing on a lake. This is the place where we would be able to see pink dolphins. I didn’t even know such a thing existed! Sure enough, pairs of baby pink dolphins began jumping out of the water. They would come up to the surface and then dive back down so quickly they were easy to miss. I knew that there were piranhas, crocodiles and of course, dolphins, in this water so I wasn’t too keen on swimming in it. One of the other girls on our tour went up on the roof of the boat and jumped in the water. Soon others were jumping in to join her. In Mexico, I had had many experiences where I made myself jump into water I was genuinely scared of. I accomplished this by telling myself if I can swim in a crocodile filled lake in the middle of the night in Mexico I can swim in anything. So I jumped in! The water was warm and nice but I quickly got out for fear a fish would bite me. Scared shitless swimming with pink dolphins and whatever else was in this water. After “swimming” with the dolphins we headed to where we would be staying that evening. The place was incredible: an indigenous family had built several makeshift wooden buildings in the middle of nowhere on the Amazon River high on stilts. All of the buildings were connected by walkways. The main house hosted the kitchen as well as a few long tables for eating. There was another building with outdoor showers and toilets. The toilets weren’t exactly toilets but toilet bowls without the seat which you flushed by pouring water from a bucket into the bowl. The showers used water from the Amazon and were just metal pipes sticking out of the wall. Our sleeping quarters were located in another building and were not as terrible as I had envisioned. Each room had two beds with clean sheets, a decent mattress, and a mosquito net. The mosquitoes were terrible and I was constantly dousing myself in bug spray. Apparently, mosquitoes are attracted to the color black and most of my wardrobe is black (yup, I’m from Seattle!). I was their target. The next morning, the plan was to go fishing for piranhas. When I think of fishing, I think of sitting in the middle of a peaceful lake relaxing while I wait for the fish to bite. Thinking we would be in the middle of a lake in the sun, I put on a pair of shorts and a tank top and joined the rest of group in a canoe. The guide told us there was a hole in the boat so someone occasionally would have to empty the boat of water using a plastic bucket. I decided to sit in the back of the boat where the least amount of water was, thinking it would be a safe bet. We headed out, paddles in our hands and began to float towards the jungle. Our guide was seated in the front with a machete in one hand and a mixture of juice and alcohol in the other. When we reached the thick brush of the jungle our guide began to cut away at the branches using his machete. I quickly realized we would not be fishing in the middle of the lake but deep in the Amazon jungle. Keep in mind we were not deep in the jungle where other tour groups had been. Our guide was literally cutting out a new path of unexplored jungle for us! Worried I would drop my camera in the Amazong to become fish food, I decided not to take it with me on the fishing journey. So you’ll have to use your imagination for this part. This picture was taken at a Brazilian fish market at the beginning of our Amazon journey. I found out a tank top and shorts were a terrible choice to wear. As we floated deeper and deeper into the jungle ,I had to duck under branches covered in large black biting ants. A few of the ants fell onto me and bit me. Their bite was like nothing I have ever experienced. Not only was the actual bite extremely painful, but the bite continued to sting and swell for the next few hours. As if the ants weren’t enough, there were also plants with giant thorns that our guide warned us not to touch: some of them came so close to I had to pushed them away with my oar. When the boat finally reached the “fishing location,” I realized that the boat had quite a bit of water in it and the person who was supposed to empty it out was not doing their job. Being in the back of the boat, I wouldn’t be able to empty out much of the water so it was completely out of my control. I nicely reminded them to continue to empty the boat of water so we all wouldn’t be swimming with the piranhas. My anaconda don’t want none unless you got buns, hun. Sitting in the middle of the jungle, we were surrounded by branches on all sides. Loud deep noises I believed and hoped came from monkeys and hissing cicadas made it hard to hear anything else. As we sat in the boat I could see giant tarantulas on nearby branches. I was terrified, this was not my idea of a good time. I wanted to push myself but this was a little too far. Our guide continued to drink and would even sometimes grab spiders off branches to scare us with. We were handed bamboo sticks with string and a hook attached with raw chicken on the end. I think all of us were in shock and sat in silence as the cicadas hissed louder and louder as we waited for the piranhas to bite. At this point, I was drenched in sweat from the heat and humidity. Strange bugs were flying around us and I would have a mini freakout every time I found the occasional spider climbing on me. After an hour, we hadn’t gotten any bites but the group had had about enough of this jungle experience. We asked the guide to take us back to where we were staying. As we commenced our trip we realized the guide was lost! Whether it was because he was drunk or was the jungle hard to navigate, he couldn’t find the path. He began trying to cut a new path. By this time he was super drunk and exhausted from hacking away at branches. I could easily announce – We were officially lost in the middle of the Amazon! Hanging with all my new best friends in the Amazon. I almost stated crying. I was covered in bug bites, in a boat that was full of water in the middle of the jungle. This was the first time on my trip that I thought, “Okay, I’ve seen enough. I’m ready to go home.” We tried different routes for the next hour until the guide finally found the way out. When we returned back to the makeshift buildings on stilts, I was ready to get the hell out of the jungle and back into civilization. I’m glad I had this experience, but I will not be returning to the jungle anytime soon, if ever. Totally understand all your complaints and yet, intrigue, for this region, its people, wildlife, discomforts and beauty. it’s the tourist (rather visitor) who is willing to put up with all the above who truly comes to appreciate life and how people navigate through life. So glad you had this experience – you made it and you’re still alive to tell such an interesting story and experience of visiting the Amazon Jungle. Those pictures of you with the anaconda around your neck and jungle monkeys on your shoulders are priceless! One question – Do the monkeys seem happy and are they well cared for? You know me – I’m an advocate for humane treatment of animals (and humans). Awe! Thanks Mom. You’re so sweet. Yes the monkeys actually live on an island with a family. They treat them like part of the family. They’re well cared for and not forced to do anything.